Philadelphia might've waited 24 years for John Foley's red hat, but between the rivers in what's now Iraq, generations of the Chaldean Catholic community have stood it out a good bit longer to see their patriarch take a place in the papal senate. There is neither a cross nor a sign on the heavy metal gate to indicate that this is the official residence of one of the country’s most prominent Christians, the first in Iraq in modern times to be elevated to cardinal by the Roman Catholic Church. The simple structure, in a dilapidated neighborhood of this capital, opposite empty former ministry buildings, is the home of Cardinal Emmanuel III Delly, whom the pope named on Oct. 17 to the College of Cardinals along with 22 others from around the world. The only outward sign that this compound is Christian is in the garden, where a lawn surrounded by roses and zinnias is watched over by a graceful white statue of the Virgin Mary. Many of his fellow cardinals come from Latin America, Africa and the Far East, places where Catholic practice is only a few hundred years old. But Cardinal Delly, 81, the patriarch of the Baghdad-based Chaldean Church, comes from Mosul, in northern Iraq, a place where Christian rites have been practiced for nearly 2,000 years. There, as in Baghdad and other places where members of Iraq’s shrinking Christian population still live, it is possible to attend a Sunday Mass sung in Aramaic, one of the Semitic languages spoken at the time of Jesus. A fluent speaker of Italian, French and his native Arabic as well as some English — he spoke in Italian in this interview — Cardinal Delly has spent his life thinking about the common ground between Muslims and Christians. He indicates that he views his role in a broad sense as an Iraqi spiritual leader. But he also has spoken up on behalf of Iraq’s Christians. During the summer, he and the Assyrian patriarch issued a call for help for Iraq’s Christians after a Chaldean priest and three assistants were killed in Mosul. Cardinal Delly met recently with Prime Minister Nuri Kamal al-Maliki to plead for protection for Christians. During the writing of the Iraqi Constitution, he met with Grand Ayatollah Ali al-Sistani, the Shiite religious leader in Najaf, who shares his ecumenical views on faith. 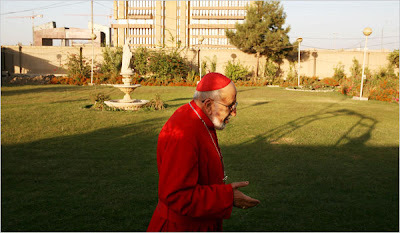 The new cardinal was born in Mosul to a Christian family in which several close relatives also became priests. His maternal grandfather became a priest, as did several cousins. He went to school there until he was 19, when he left for Rome to study. He stayed 14 years, traveling through Europe to holy places and completing his studies. He obtained three degrees — a master’s in philosophy, a doctorate in theology and a doctorate in canon law — and his studies included the Koran. In philosophy he chose to study Abu Nasr al-Farabi, an eminent early Islamic philosopher. For his doctorate in theology, he wrote on a debate about religion and virtue between a 10th-century Christian bishop and the Muslim minister of Morocco. “The Christian house is next to the Muslim house,” he said. “Each has his own religion, each defends his own home, each defends his religion. Alongside Pope Benedict's desire to encourage the Christian community in Iraq amidst its recent suffering, his elevation of the Babylonian patriarch was reportedly geared toward ensuring Delly's continuance in office; the Eastern prelate was elected to his current post a year after his retirement as an auxiliary bishop of the Baghdad-based see.